Periodically businesses require a purge of files stored onsite at their facilities. 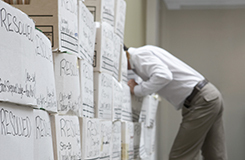 A number of companies have a comprehensive records management program requiring the destruction of active files that have reached the end of their retention period. Some businesses may want to turn storage areas into billable office space, while other companies may simply be relocating to another building. Whatever the reason, it is necessary that one time shredding and file purges be executed quickly and securely. Sugar House Archives & Shred’s one-time shredding service allows our clients to destroy unwanted documents in a timely manner without the additional investment of internal staff and resources. Once you’ve determined which documents you wish to purge, simply call us. We can drop off locking containers before your shred project or simply pick up the boxes of documents you wish to purge – whichever you prefer. We send a trained professional to pick up and transport your documents to our plant based facility or to shred them onsite at your business. With either option we maintain a strict chain of custody, ensuring the confidentiality of your information. We will provide you with a certificate of destruction for auditing purposes. If you are interested in Sugar House Archives & Shred’s One Time Shredding service, please contact us by phone or fill out our form.